About three months ago, I gave up the big city life and career to live in a campervan and travel around beautiful New Zealand. Just you? I hear that question a lot. When checking in at campgrounds, from fellow travellers, people I meet along the way… Even before I had actually started the vanlife friends, colleagues and others who heard about my plans would ask “all by yourself?”. 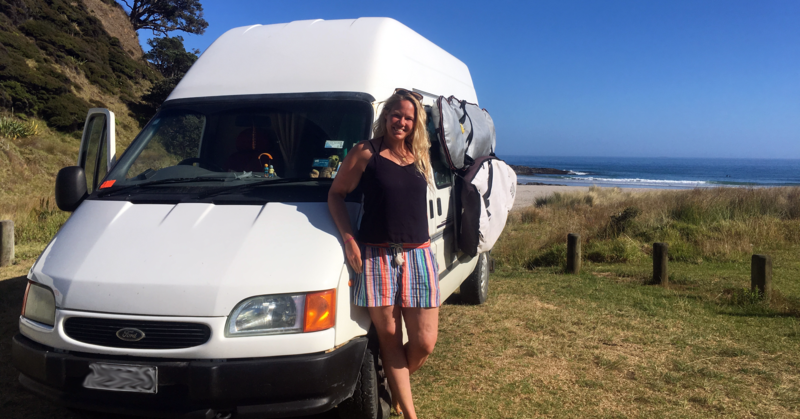 If the last three months have made one thing very clear, it’s that traveling seems to be done in pairs – especially traveling in a campervan like I do. Most of them are couples. But apparently, if no partner is on hand, a friend, sibling or even just a random person are preferred over doing it alone. Since I’ve left Auckland almost three months ago, I’ve met maybe 4-5 other solo travellers – and when I say ‘met’ I include those I’ve only really seen from the distance. Groups of 3 or 5 are almost just as rare. Traveling is something that most people seem to prefer to do in pairs! But the more I think about it, the more I realize that it’s not just traveling. Most people seem to prefer doing life in pairs. I think I’m only just starting to realize just how true that is and how rare exceptions are. I still have a few single friends but the number has decreased drastically in the last few years. These days, more often than not, I’m the only single among the couples. And gone are the days where people are dating and different partners come and go, with them being single in between. The couples around me now are solid, meant to last. Have you ever wondered why it is that the far majority of people seem to find their life partner (or at least long-term partner) around their late 20s and early 30s? I mean it can’t really be a coincident that everyone meets ‘The One’ at that time in their lives. There must be another reason. The cynic in me wants to say it’s because that’s what society tells us to do, what everyone else is doing. And so most of us follow suite. I’ve seen it happen with friends many times. They have this idea in their mind what the ideal partner looks like. They are not interested in potential partners because they are too short/tall, don’t have a promising career or don’t have the same hobbies. They end relationships because he plays too much xbox or because he refuses to shave his beard. Until one day, The One shows up and even though he is short, has a beard and plays xbox, he’s ‘perfect’. Soon after, they are married and kids are on their way. Sometimes people call it ‘settling’ – in a negative kind of way. I call it being happy – at least when it’s for the right reasons. When we’re young, we all have ideals about life and pictures in our head of what our perfect life should look like. We’re young and naïve and haven’t learnt yet that a lot of that superficial stuff doesn’t really matter. What matters is being happy. And a big part of being happy is figuring out what really matters in life and what we really want. I think what happens to most people in their late 20s and early 30s is exactly that. They figure out what really matters and what makes them happy. And for most of them, that involves figuring out that having a long-term partner to start a family with matters more to them than finding the guy/girl from their teenage dreams who is beautiful, fun, has all the same interests and who they never argue with (and who never plays xBox, of course). So they ‘settle’. And that’s a good thing because it means they prioritise what really makes them happy instead of chasing a romantic fantasy. But let me be very clear about one thing. I am in no way saying that if you want a husband/wife and a family you should settle for the first available person no matter who they are. You should never settle for someone you don’t love. You should never settle for someone who doesn’t treat you with respect and kindness – no matter how much you love them. You shouldn’t settle because you’re scared to be on your own. Or because you’ve gotten so comfortable in your relationship that leaving just seems too hard. You see people settling for the wrong reasons all the time. I think in most cases it’s because they don’t really know themselves well enough yet to really understanding their goals and priorities – or they don’t have enough confidence to stand up for themselves and to know they deserve better. What I’m talking about here is that if you want to find that life partner and you meet someone who treats you well and has similar goals and values, then being able to overlook the fact that he or she maybe doesn’t look like you had pictured or doesn’t have the same interests as you, and allowing yourself to fall in love with them, allowing yourself to ‘settle’, is the way to a happy life. But what about those few of us who don’t find that life partner when everyone else does? Are we too ‘stubborn’ to stop chasing the romantic fantasy and settle? Or are we just unlucky and haven’t met someone who’s a good fit yet? While that might be the case for some, I think for a lot of us it’s actually more about having different priorities. Just like everyone else, we get to know ourselves in our late 20s and early 30s and we start to understand what matters most to us and what makes us happy. It’s just that for us, ‘finding a life partner’ doesn’t make it to the top of the list. And maybe I’m just speaking for myself here. But I don’t think so. I think for some of us, whether we really know it or not, other things like our freedom and independence, alone-time or investing time in friendships and our social life or our careers are more important, make us happier, than finding The One and starting a family. Sometimes I hear people talk about wanting to find the life partner and have a family but then they dismiss potential partners for the most superficial reasons and I can’t help but wonder if maybe they don’t really want that family life (yet) but haven’t really realized it yet. Because, let’s be honest, we are all being pushed into that direction by society and often our family and friends. It’s not easy to swim again the stream. At the end of that day, I can only really talk about my own feelings and experiences and I don’t want to make wild assumptions about other people’s behaviours and life choices. All I want to do is provoke some thinking! As for me, sometimes when I look around me and all I see is couples, I can’t help but wonder if something is a bit wrong with me. I can’t help but feel a little bit depressed sometimes when people ask ‘just you?’ as if there’s something wrong with that. And I do sometimes wish I had found that person. But deep down inside I know that the main reason I haven’t yet, is simply because other things matter more to me right now. And I’m not gonna let society, or my own insecurities, pressure me into a certain direction just because that’s what everyone else is doing. I’m gonna do life on my own terms and with my own timeline. Maybe, one day, finding that person will be my top priority. Maybe one day I’ll meet someone who will make me want to give up some of my independence. Maybe I won’t. For now, it’s just me. And that’s exactly how it’s meant to be right now. Or follow me on Instagram and/or Facebook. Are Smartphones Destroying Our Travel Experiences?